British clarinettist Matthew Scott graduated with a 1st Class honours degree from the Royal Academy of Music in 2013, followed by an MA with Distinction and DipRAM in 2015. He was awarded a Full Scholarship for the duration of the Undergraduate course and was generously supported by The Countess of Munster Musical Trust and The Greenbank Scholarship in his Postgraduate studies. Matthew works regularly with duo partners Daniel King Smith and Christine Zerafa and is delighted to be a Selected Artist as Matthew Scott and Friends for Making Music. He is a former Artist for both Making Music’s Philip and Dorothy Green Award for Young Concert Artists and The Countess of Munster Musical Trust Recital Scheme. He was Wind Finalist in the Royal Overseas League 63rd Annual Music Competition, 34th and 35th Bromsgrove International Young Musicians Competition’s and won Wind Category 1st Prize in the 2014 Tunbridge Wells International Young Concert Artists Competition. In 2015 he was invited onto the London Sinfonietta Academy and Britten-Pears Young Artists Platform. Matthew has performed at major London venues including Eaton Square, Kings Place, LSO St. Lukes, St. George’s Hannover Square, St. John‘s Smith Square, St. Martin-in-the-Fields, St James’s Piccadilly, St Margaret’s Westminster, Queen Elizabeth Hall and Wigmore Hall. He appears on the RAM Soloists Ensemble’s critically acclaimed CD of Bruckner’s Symphony No.2 under Trevor Pinnock (Linn Records) and also on the Aldeburgh Strings and Winds CD of Strauss masterpieces under Nicholas Daniel (Linn Records) Matthew has recently performed concertos with orchestras including the London Festival Sinfonia, Southern Pro Musica and Petersfield Orchestra and Oxford Sinfonia, he also works as a freelance orchestral musician. Matthew is founding member of Ensemble Mirage, a dynamic flexi-ensemble based in London, UK. Originally called Trio Mirage (Cl/Vln/Pn), the ensemble won the Harold Craxton Prize and a Chamber Music Fellowship at the Royal Academy of Music for 2015-16, before evolving into the current flexi-ensemble; enabling the exploration and programming of the whole range of Clarinet-String-Piano chamber music. Ensemble Mirage have since performed at Music Festivals and venues around the UK including the 2015 Two Moors Festival, The Lantern Colston Hall and the 2016 Norfolk and Norwich Festival. Other collaborations include the Delmege and Fitzroy Quartets, contemporary ensemble Khymerikal and contemporary collective NonClassical. Matthew made his St. Martin-in-the-Fields solo recital debut in January 2015, followed by October 2015, and May 2018. He regularly performs solo and chamber recitals for music societies and festivals throughout the UK. Ensemble Mirage were delighted to be 2016/17 St. John’s Smith Square Young Artists. Most recently Matthew has been selected as a 2016/17 Park Lane Group Young Artist with duo partner Christine Zerafa and in 2018 is a founding member of Bournemouth Symphony Orchestra’s Change Makers Ensemble, BSO Resound. During his studies, Matthew has performed in many public masterclasses given by eminent teachers and performers including: David Campbell, Martin Fröst (most recently at Wigmore Hall), Karl Leister, Andrew Marriner, Patrick Messina and Robert Plane. Other teachers include Tim Lines, Chris Richards, Angela Malsbury, Richard Addison, Chi Yu Mo and Lorenzo Iosco. Having played principal positions in many of the Royal Academy orchestras and ensembles on the whole range of clarinets (Bb/A/C/Eb/Alto/Basset Horn/Bass and Contrabass) he has worked under many of the world’s most celebrated conductors. He has performed in Royal Academy of Music Opera productions of Mozart Die Zauberflote under Jane Glover and Strauss Ariadne auf Naxos under Elgar Howarth. He has also worked with singers at the Aberystwyth MusicFest including a recital performance of Schubert Shepherd on the Rock. Prior to Music College, Matthew studied with David Campbell privately for 2 years. He was awarded Distinction in the ABRSM Performance Diploma in 2009. He was a member of the multi award winning Bromley Youth Music Trust, with whom he made 5 summer tours to Europe, including performance at the WMC Kerkrade in 2005 and 2009. Matthew returned as soloist with Bromley Youth Chamber Orchestra playing Finzi’s Five Bagatelles on tour in Bromley and across Hungary in summer 2010. 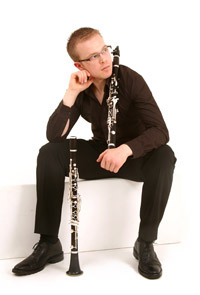 He made his concerto debut in June 2009 playing Weber’s Clarinet Concerto No.2 with Bromley Youth Symphony Orchestra and was invited back to play the Mozart Clarinet Concerto in April 2012 with a specially formed orchestra of ex BYMT members in a concert in memory of his early teacher Derek Wallace. He was the Norman Trotman Competition 1st Prize winner in 2007 at BYMT. In 2002 Matthew was diagnosed with Aspergers Syndrome and OCD. This has brought up many additional challenges along the way but Matthew believes that this does not need to be a bar to achieving a successful career in music. He is grateful to many people who have helped him reach where he is today. In 2018 Matthew has been selected as part of the Bournemouth Symphony Orchestra’s new initiative led by disabled musicians, the ‘Change Makers Ensemble’ , BSO Resound. With dual diagnoses of Asperger’s Syndrome and OCD, Matthew will be working to promote awareness of High-Functioning Autism in the music industry through the activities of the ensemble; particularly in the orchestral sector.